Book Review: Real Estate Finance and Investments – The Ultimate Guide to the Industry? Do you learn best by reading? It’s a bit mixed for me. While I do read a lot, sometimes video is a superior format: I couldn’t imagine trying to learn Excel or PowerPoint shortcuts from a book. But text works quite well for overviews and introductions. It’s tough to make commercial lease terms interesting in video format, but you can at least make them quick to get through in writing. …but which doesn’t hold up quite as well if you’re preparing for detailed case study exercises. What is This Book, and Why Should You Care About It? 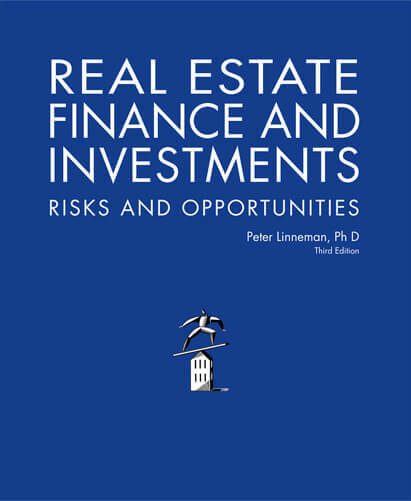 You can read more about the author, Dr. Peter Linneman, right here, but suffice to say that he’s had a long and distinguished career in academia (professor at UChicago and Wharton) and real estate investment/development. He also publishes a well-known quarterly newsletter on commercial real estate. Real Estate Finance and Investments came to my attention when I was researching the new real estate private equity case studies we created this year. I wanted to cover all my bases, so I decided to read one of the most common and highly regarded real estate references. I approached it with one simple question: Is it a useful guide for answering case study questions in interviews and preparing for the job? This review is based on Edition 3.1 of the book, the most recent one as of the end of 2015. The book takes a “survey” approach, which is apparent if you review the Table of Contents. There are chapters on commercial leases, financial modeling, due diligence, development and acquisition analysis, CMBS, REITs, RE PE funds, and yes, even ground leases; there are also supplements on finance basics such as NPV and IRR, careers in real estate, ARGUS, and sample case studies and exams. No chapter is long enough to give extremely detailed information on the topic, but each one provides a good explanation of the fundamentals (e.g., the different components of leases and how you sum them to get the net effective rent). Just like a Tinder profile where the first photo looked good but the rest “varied in quality,” there was a lot I initially liked about this book. First and foremost, it covers a very broad set of topics. For example, there’s an entire chapter on ground leases (common in mainland China and other regions where you can’t own land; you can only lease it from the government for a long time), which I’ve never seen much on in other books or courses. There’s also a chapter dedicated to real estate exit strategies, which people tend to skip over in modeling tutorials. So this book is probably the fastest way to get up to speed on the industry as a whole, and to understand the range of asset classes that relate to real estate. The author also does an excellent job explaining the fundamentals of real estate investing with several diagrams that show different scenarios. The expected return in each scenario is 15%, but the outcome probabilities vary wildly: one scenario has an even distribution over a wide range of returns, one has a single outcome with a bell-curve distribution around 15%, and the others have multiple outcomes with different bell curves around each one. He makes the point that no scenario is “the best”: it depends on your risk profile, your area of expertise, and the rest of your portfolio. This same theme is present throughout the remainder of the book: numbers are merely a tool you use when making decisions. A closely related theme is that numbers and financial models can only tell you so much. First, Cap Rates are often problematic because of calculation discrepancies, changing markets, and changing cash flows; in some cases, it doesn’t even make sense to use a simple Cap Rate because the property is changing so much. Second, “sensitivity analysis” is often nonsense because people don’t consider how the assumptions are interrelated. Can rent fall by 10% even when the vacancy rate stays the same? No, probably not. Third, complex models are often worse than simple ones. If the math doesn’t work in a simple model, it won’t work any better in a more complex one, but you will spend a lot more time building it. The chapter on Financial Modeling is great because he gives an example of a pro-forma model for an apartment complex, and then explains how and why different line items would change in different markets (decline, recovery, stable). Most other training on financial modeling skips the meaning behind the numbers, which is what Linneman excels at here. But as I kept reading, I realized there were also several difficult-to-overlook flaws – sort of like what happens when you keep flipping through someone’s photos and find the non-model-like ones. First, I don’t think the coverage here is sufficient for completing case studies in interviews. It does give you the required background information, and there are a few useful exercises at the end. But these examples are not that close to what real estate firms ask candidates to complete in interviews. There are some useful pieces that you could use for case studies. 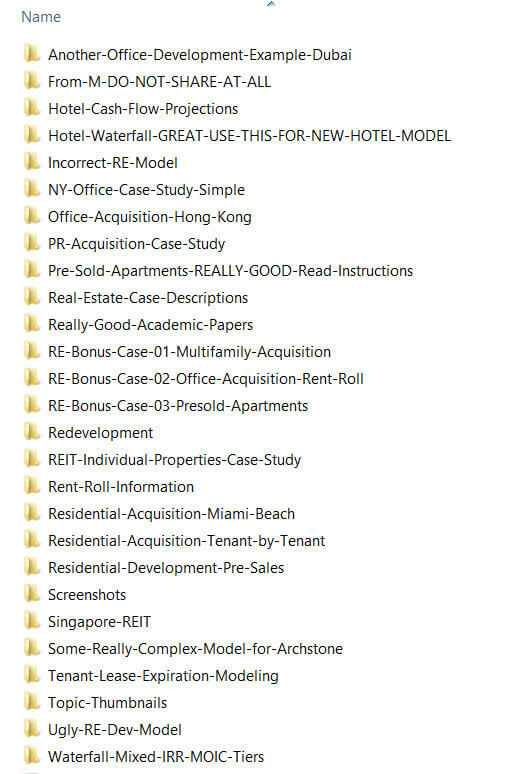 For example, you could combine the chapter on the real estate pro-forma with the one on exit strategies and the one on calculating IRR, and get enough to complete a simple exercise (like our first RE PE case study). But there’s no step-by-step walk-through that puts all those pieces together. Throughout the book, Linneman has a tendency to go off on tangents and show extreme biases on a few issues. I’m not sure if these non-sequiturs were meant to be sarcastic, but they came across as a bit… odd. This claim is sort of true in real estate because Depreciation affects only the taxes – but it seems like he doesn’t understand the accounting purpose of Depreciation in other industries: to allocate a capital expenditure over its useful life. A few paragraphs later, he goes into the relationship between Depreciation and getting members of Congress re-elected. This tangent stood out as particularly strange, but there are other, similar oddities throughout. Similar to Damodaran, Linneman is also at odds with mainstream thinking on a few points. For example, in one section he explains why IRR doesn’t apply to development projects: the risk profile, and therefore the appropriate discount rate, differs at each stage of the project, so “back-solving” for a single discount rate, as the IRR function does, doesn’t make sense. From a finance theory perspective, yes, he is correct. However, in case studies and on the job you’ll still be asked to calculate IRR for development projects since the terms of the deal, such as waterfall promotes, are often tied to IRR. To be fair, the book does include coverage of markets outside the U.S., and two of the case studies are international: one in London and one in Tokyo. These points might have had elements of truth a few decades ago, but they don’t hold up as well in 2015. Also, I’ve collected dozens of real estate case studies from regions outside the U.S. – what exactly are investors putting their money into if the markets are dysfunctional in other places? I’ve completed a number of online real estate courses in the past. The biggest weakness of these courses – no names mentioned – is that they tend to focus too much on formulas and calculations and not enough on the why behind the numbers. This book has much better explanations of the logic and rationale, even if it doesn’t go as in-depth into Excel as courses do. And then there’s our own Real Estate Financial Modeling course. The main advantage of Real Estate Finance and Investments is that covers a much broader set of topics than we do. Linneman also takes the time to cover topics, such as the time value of money and IRR, that we skip because of coverage in other courses on the site. So his book could be a good prerequisite for the course we offer. You always have to be careful when “everyone” recommends one book as the best source for learning an industry. I wasn’t disappointed with the Linneman book; parts of it were quite good, and offered clear, concise explanations of important topics. If you have any interest in real estate, you should read this book as your first step. But as with learning any industry, reading alone is not enough. This book works best when you put it into practice with real, Excel-based case studies – however you find them. Until you do that, this reference is “useful, but not sufficient” as you prepare for interviews, internships, and jobs. You might prefer watching, listening, or reading for learning new concepts, but nothing beats doing. I am interested in reading a book that will walk me through a case study that will serve as a detailed framework by which I should evaluate a 30 unit apartment complex. I am hoping there is a book that will walk me through excel models to achieve this evaluation/assessment. My question to you is, are there any books that will serve this purpose; a book that can walk me through my own case study? Thank you in advance for your time in responding to this comment. I enjoyed your post. I don’t know of a book, sorry. We cover similar case studies on the site… do a search. Very helpful, Thank You . This is great. Would you recommend any books for other industries as well? Thanks! Unfortunately, I haven’t found anything good on those industries yet. I bought a few oil & gas books before, but nothing worth mentioning here. They were either too general or got into too many unnecessary details on accounting minutiae rather than explaining how to use the concepts in real life. Liked it, thank you for the efforts . In spite of shortcomings,this book appears to worth of giving a look at. I can bear him out when he talks about non US market , like here in Delhi and NCR region for a developer some kind political collusion is kind of required to acquire the land, availability of capital is not an issue any more even for a small developer. One general question, is it deliberate that you don’t put publishing date on your articles or I am missing something obvious ? Yeah, like I said, it is worth looking at even if it’s not perfect. We purposely leave out dates from articles because most of the content here is not time-dependent. When it is time-dependent or somewhat more time-dependent, we give at least a year or approximate date, as we did here. Alright !! and one more thing, above mentioned, your collection of Real Estate & REIT is part of the course. So one gets each and every thing of these case studies or just few of them only ? while S/he enrolls for the course . We offer three of these case studies in the course, because the idea is not to say, “Oh look, here are 1,242,842 case studies! Finish them!” and provide no instruction, but rather to focus on the few best ones and then provide a comprehensive walk-through of each one via step-by-step lessons. Also, I am not allowed to share many of the ones that have been submitted over time. So no, you do not receive everything I’ve collected. You do get the 3 case studies covered on this site, and in far more detail and taught via step-by-step lessons.